Canada and the United States share the Great Lakes fishery, a binational treasure worth more than $7 billion annually to the people of the two nations. The fishery attracts millions of anglers, supports valuable commercial and charter fishing, is a mainstay for native peoples, and is the very fabric of a healthy environment. The Great Lakes Fishery Commission, operating through the 1954 Convention on Great Lakes Fisheries, today facilitates successful cross-border cooperation that ensures the two nations work together to improve and perpetuate this fishery. While the lakes fall under the jurisdictions of two nations, eight states, one province, and several tribes, the fishery resources do not observe political boundaries. Canada and the United States recognized decades ago that the best way to manage and sustain the fishery is through continuous, binational cooperation. Remarkably, a mechanism to collaborate across borders was not always present. Efforts to establish an international fishery commission for the Great Lakes failed repeatedly from the late 1800s to 1954 because of a poor understanding about how to work together and because the states and the province were unwilling to cede fishery management authority to a binational agency. The destructive power of sea lampreys compelled Canada and the United States to develop a successful collaborative relationship. Sea lampreys, which invaded the upper Great Lakes in the early 1920s had, by the 1950s, severely destroyed valuable stocks of Great Lakes fish, particularly whitefish and lake trout. Other factors, such as habitat destruction, poor water quality, and overfishing, also contributed to the decimation of the fishery by mid-century. Something needed to be done at the highest level if the Great Lakes fishery was to be saved from complete devastation. The convention also includes a clause mandating the commission to establish "working arrangements" among governments to ensure multi-jurisdictional fishery management. 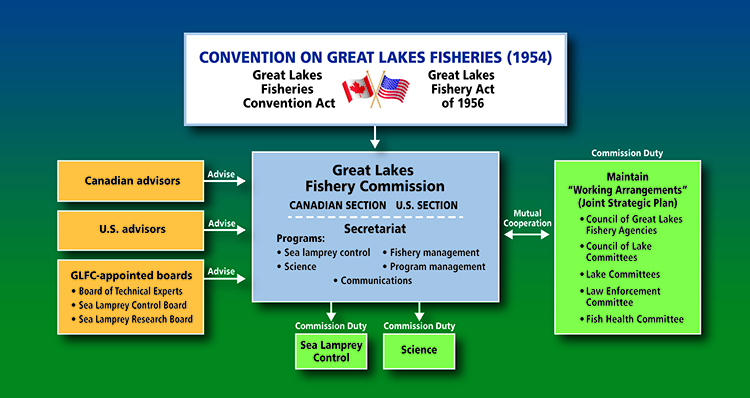 The commission, thus, became a focal point for cooperative Great Lakes fishery management, though was designed specifically to not supersede existing state or provincial management authority. The commission formulates its program based on advice from several research and management committees, comprising scientists, fishery managers, and academic experts. In addition, the commission receives advice from the Committee of Advisors, made up of citizens from Canada and the United States. 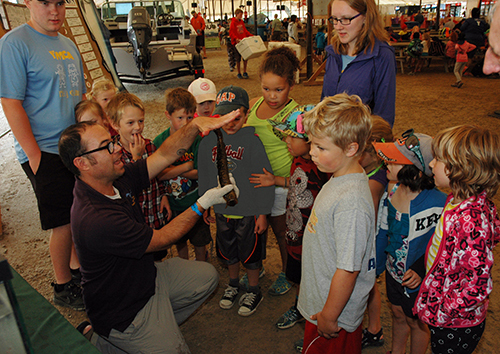 Sea lamprey control is implemented in partnership with the U.S. Fish and Wildlife Service, Fisheries and Oceans Canada, and the U.S. Army Corps of Engineers. Research is conducted in cooperation with the U.S. Geological Survey; state, provincial, and tribal authorities; and universities. 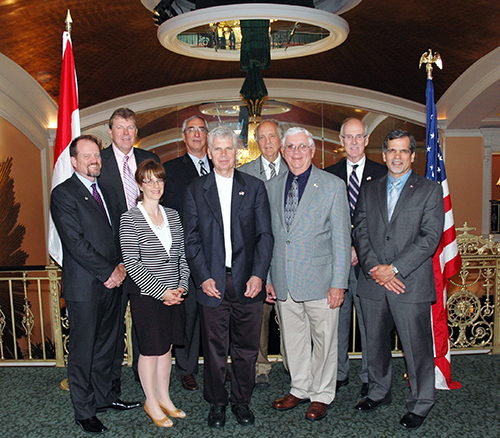 Since 1954, the Great Lakes Fishery Commission has ensured an on-going, robust working relationship between Canada and the United States for the benefit of the fishery and the millions of citizens who depend on the resource for food, subsistence, recreation, and income. Today, the management regime on the Great Lakes is viewed as a model for successful, cross-border cooperation. The Applegate Award to recognize an individual or group furthering the cause of sea lamprey control on the Great Lakes. The Besadny Award to recognize an individual or group exemplifying extraordinary commitment to building strong and lasting partnerships in Great Lakes resource management. The Christie/Loftus Award to recognize an individual or group making significant scientific contributions toward understanding Great Lakes ecosystems and the fisheries they support. We welcome your nominations! Nominations are accepted during the fall. Recipients will be honored publicly during the commission’s annual meeting and will be presented with an engraved plaque. Each recipient will also have his or her name engraved on a permanent plaque to be displayed at the secretariat.